For anyone not familiar with SCADA - it stands for ‘supervisory control and data acquisition’. These systems are prevalent in many modern industries including, energy, food and beverage, oil and gas, and manufacturing. They enable enhanced control and efficiency, present data for smarter decisions and communicate system issues to help mitigate downtime. Line control is not a new concept for the industry and many packhouses have a basic line control/automation system. Smartline takes them to take the next level. 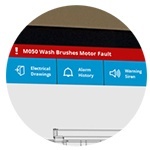 Complete visibility and control - Respond quickly to issues with fast access to automation controls. Improving on older products, Smartline offers increased visibility by displaying an integrated layout on a single screen. This includes access to all the key control functionalities including motor locations, start/stop, speed control and e-Stop locations. Situational awareness - Never miss an important issue. Operator focus is maximized by presenting highly contextualized and easily interpreted information specific to key process issues. This includes active alarms and events, and automatically decluttering other information. Complete support coverage - Ensure fast resolution of faults and lower your cost of ownership. A complete electrical and automation solution from Compac means our skilled service team cover all aspects of the machine, avoiding multiple service call outs and scheduling. User centric design - Minimize staff training needs and make automation more accessible across the team. 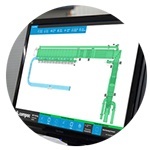 Smartline has been designed with packhouse operators in mind and tested with leading customers. 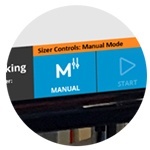 The modern interface ensures your team is packing produce and not searching for manuals. Best in breed - Invest in technology that can grow with changing business needs as the industry undergoes digital transformation. Smartline is built on the industry leading Wonderware® platform to ensure productivity, reliability, security and interoperability. A key consideration when building Smartline was to consider the range of customers we serve, from small family growers to multinationals with many sites. Clever design means it can be configured for a perfect fit for different scale packhouses. Smartline is available now and please get in touch with us if you have any questions on how your packhouse can take the next step in the digital future of food.